I've always been uncomfortable with right wing / patriotic dumping on Islam since 911. Even going with "radical" Islam or "highjacked" Islam inevitably bleeds over into "good" Muslims who just want to be left alone and have as much to do with 911 as I do with the Crusades. 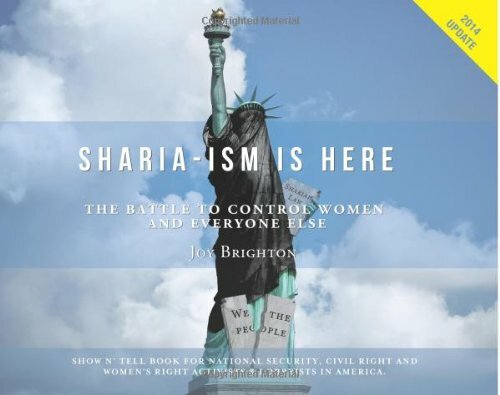 Joh Brigton has a new book titled, Sharis-ism is Here: The Battle to Control Women - and Everyone Else that brings up the interesting new tactic of Sharia-ism. It seperates Muslim out of the equation both in debate and the courtroom. In April 2014, the Universities of Michigan, Chicago and Illinois and Brandeis University refused to screen the Honor Diaries,a documentary released the previous month. By doing so they chose not to acknowledge nine Muslim, Sikh & Christian women rights leaders, who expose the brutal abuse of women and girls justified in the name of religion, culture, “honor” or Shariah. Yes you read this correctly. Some of our country’s most prestigious educational institutions are actively shutting down Free Speech and thereby silencing those trying to reveal the heart-breaking abuse of women. Does Freedom of Religion over-rule the abuse of women? Why has violence against women become political? Where does religion end and politics begin?